Q. What is God’s name? A. 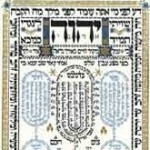 The four-letter Hebrew name which we translate “The Lord” comes from a root which means “to be”, and it indicates that there is a unique quality in God’s Being. Insofar as HaShem has a personal name, it is composed of these four letters. The name we translate as “God” is not so much a personal name as a designation, a title. Rabbinic literature tended to use substitute descriptions of Him such as “The Holy One Blessed be He”, “The All-Merciful”, “The Omnipresent”. There are nearly a hundred such substitute names. In Yiddish He is often known as Der Ebishter – “The One on High”. German Jews preferred the appellation, Shem Yisborach – “The Name, Blessed be He”.